One of many reasons the beguines flourished in the Low Countries and why they are more often remembered in connection with that area than with any other part of Europe where they established themselves is because they had the protection and patronage of the local nobility. Many of the greater court beguinages and hospitals were founded by countesses. Later, in the 14th and 15th centuries, when the beguines faced scrutiny and repression, these greater beguinages were able to survive with the help of their patrons. The interest in beguinages on the part of the nobility of the Low Countries seems to have started with the sisters and successive countesses Jeanne and Margaret of Flanders and Hainaut. The pair of them set the precedent with their foundations in several cities, most notably Ten Wijngaerde in Bruges and the Groot Begijnhoof in Ghent. The latter of these also shows the close association between the beguines and the Cistercians,* since it was closely associated with the convent of Mary’s Haven founded at the same time and the hospital associated with both communities was largely staffed by the beguines. Both of these countesses also involved themselves in legal issues related the communities within their lands and took steps to protect the beguines living in them. ** They both left significant amounts of money in their wills to a number of communities, including many they had no hand in starting. Jeanne and Margaret’s successors followed in their footsteps, as did many people of less powerful origins. Patronage of the beguines increased in the 13th and early 14th centuries as new communities were paid for and various counts confirmed earlier donations. But by the late 14th century, serious suspicions about the beguine’s morals and orthodoxy had begun to arise. These were “disorderly” single women*** who were not enclosed and could move about among lay people. Smaller convents began to disappear as their members died off, joined larger communities, or joined more regular Orders. They lacked the resources to continue in the face of first Catholic and then later Protestant disapproval. It was the courts that were best off, in part because they were big enough to have patrons among the nobility, who could provide resources and legal protection. Some of these communities survived all the way into the late 21st century, with the last beguine, Marcella Pattyn dying in 2013. *Both Countesses were closely tied with this Order too and may have developed their respect for it through their encounters with Blanche of Castile during their childhood. **Not only from those who would take advantage of women living “on their own,” but also from family members who wanted to force them to renounce the life of a beguine to come home and marry. ***Literally. They did not belong to any monastic Order. And don’t blame me for the pun. I stole it from Walter Simons’ Cities of Ladies. Simons, Walter. Cities of Ladies: Beguine Communities in the Medieval Low Countries, 1200-1565. Philadelphia: University of Pennsylvania Press, 2003. Ward, Jennifer. Women in Medieval Europe: 1200-1500. New York: Routledge, 2002. In my reading about medieval religious women, I’ve frequently come across passing references to “canonesses.” A lot of the time it gets used interchangeably with “nuns.” Many people seem unsure as to whether the difference between the two is even important. Even some medieval writers, purposefully or not, blurred the distinctions between the two groups. There was a difference though, and by the fourteenth century it was one that houses of canonesses had to fight to defend. The thing is, canonesses had some similarities with nuns. Both groups lived in community under the authority of an abbess, devoting themselves to the religious life. Unlike nuns though, canonesses were not strictly enclosed and did not focus primarily on contemplation. They acted outside the cloister and were not bound to it, leaving to perform public liturgical functions like ringing the bells, taking part in synods* and participating in religious processions. They lived in individual quarters around the cloister, maintained personal property, and many employed their own servants. In many cases, it is hard to distinguish whether a particular group of women were canonesses or nuns. Many sources use the same term for both, in some cases as part of an effort to get canonesses to act more like nuns and restrict their movements. Canonesses can be divided into two groups: regular and secular. Regular canonesses took permanent vows and lived strictly according to a Rule, usually that of St. Augustine. Secular canonesses, with the exception of the abbess, were not so bound and could leave to get married if they wished. Many communities of both sorts became centers of great learning, the best known being Quedlinburg and Gandersheim. Male church officials were not so fond of the canonesses’ more free and less ascetic way of life and tried many times to restrict their movements, though there was only so much they could do. Most canonesses came from wealthy, powerful families with an interest in maintaining their female relatives’ freedom and the political power that came with it. They managed to defend their status up to the Reformation, at which point most communities of canonesses became Protestant and either disbanded or continued to exist as communities of single women. Makowski, Elizabeth. "A Pernicious Sort of Woman": Quasi-Religious Women and Canon Lawyers in the Later Middle Ages. Catholic University of America Press, 2005. McNamara, Jo Ann. Sisters in Arms: Catholic Nuns Through Two Millennia. Cambridge, MA: Harvard University Press, 1996. Those are some fancy hats there. Hrotsvit of Gandersheim (mid to late 10th century), canoness at the monastery of Gandersheim, has the distinction of being one of the very few Early Medieval female writers whose work survives. She wrote on both secular and religious topics, drawing from both Roman authors and the works of Church Fathers. The three books in which she collected her writings contain saints’ vitae, plays, poetry, and two histories. Her works continued to be studied both for their style and their content for several centuries after her death. We know very little of her life beyond her writings. We can say with certainty though that she was of Saxon ancestry came from the nobility. In her works she speaks of her Saxon heritage with pride. Her membership in the community at Gandersheim, meanwhile, shows that she must have been a member of the German nobility, since only the daughters of this social class could take the veil there, where the abbesses were princesses in their own right. Gandersheim had, by the time Hrotsvit arrived there, become a famous cultural center and place of learning. It was here that she studied under her abbess, Geberga II, and a fellow canoness named Rikkardis, both of whom were known for their intelligence. She read not only the theological writings of her predecessors, but also Roman writers like Vergil, Horace, Ovid, and Terence, becoming so familiar with Terence that she wrote many of her works in his style. Some people felt that in doing so she performed a correction, taking the playwright’s style and using it for an appropriate purpose, religion, rather than for comedy. Like most other medieval female writers, she prefaced her work with protestations of being only a poor little (ignorant) woman and nobody special. It has been argued though that, as it was for other medieval writers, especially women, this attitude was only a front put up because she knew it was expected of her. Her plays are peopled with women who, using only their words and their intellect, defeat men at the highest levels of society. She may have claimed to be a poor ignorant woman, while in reality she was, and saw herself, as anything but. Brown, Phyllis R. and Stephen L. Wailes. "Hrotsvit and Her World." In A Companion to Hrotsvit of Gandersheim (fl. 960): Contextual and Interpretive Approaches, edited by Phyllis R. Brown and Stephen L. Wailes, 85-120. Leiden: Koninklijke Brill NV, 2013. Ferrante, Joan. “Public Postures and Private Maneuvers: Roles Medieval Women Play. In Women & Power in the Middle Ages, edited by Mary Erler and Maryanne Kowaleski, 213-229. Athens, GA: University of Georgia Press, 1988. Wilson, Katharina. Hrotsvit of Gandersheim: a Florilegium of her Works. Cambridge: D. S. Brewer, 1998. The earliest formal Third Orders date back to the 13th century, though similar associations of people based certainly existed before then. The timing isn’t particularly surprising, given the rising popular interest in access to the religious life at the time. 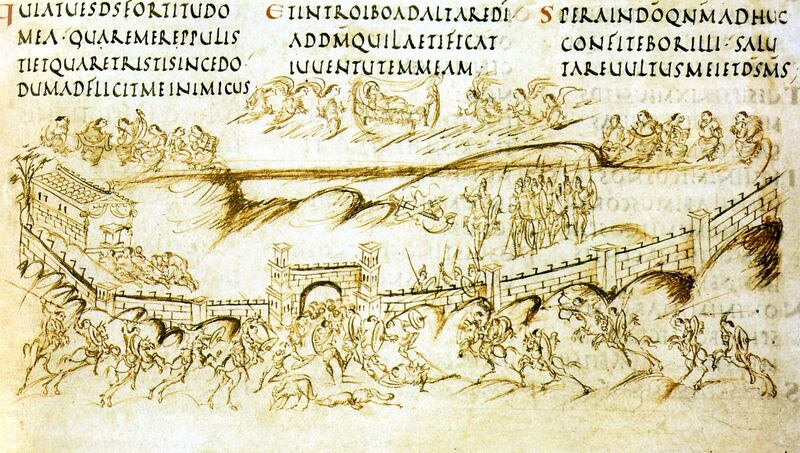 The Humiliati were the first official Third Order, but the best known is the Third Order of St. Francis. It’s uncertain exactly how it came about,*** but according to the story, their Rule came directly from Francis himself. The Dominicans and Carmelites soon gained their own Third Orders. The Lay Carmelites came about much as the Fransican Third Order did. The Dominican Third Order, on the other hand, originated as a group of Franciscans who were heavily influenced by the teachings of Dominican friars. The reaction to the creation of Third Orders was not entirely positive. Several groups ran into trouble with their city governments because their Rule forbade them to bear arms. Individual tertiaries, like Catherine of Siena, often met with significant resistance from their families. There were, and still are today, two sorts of tertiaries: regular and secular. Third Orders Regular, as they are known, existed almost from the beginning, but weren’t officially a distinct group until the 15th century. They take vows and live in organized communities. Seculars make less binding promises and usually live separately, though they still have a strong connection to their community. Well-known medieval tertiaries include the Franciscans St. Elisabeth of Hungary, St. Rosa of Viterbo, and Dante Alighieri, as well as the Dominican St. Catherine of Siena. *So called mostly because the male order was founded first. This was generally the case throughout the Middle Ages, with the notable exception being the beguines, who were never really unified enough to get that sort of formal recognition. **There are, for example both Anglican and Lutheran Orders of St. Francis, which function as and consider themselves part of the Franciscan Third Order. The Lutheran one in the US is, I believe, affiliated with the ELCA. ***Thomas of Celano’s Vita prima claims that Francis started the Third Order, but there is also evidence for a more independent community that only later claimed to have been created by him. Cook, William R. and Ronald B. Herzman. The Medieval Worldview: an Introduction. New York: Oxford University Press, 2004. Kienzle, Beverly Mayne and Pamela J. Walker. Women Preachers and Prophets thorugh Two Millennia of Christianity. Berkeley: University of California Press, 1998. Stephenson, Carl and Bryce Lyon. Mediaeval HIstory: Europe from the Second to the Sixteenth Century. New York: Harper & Row, 1962. Gobry, Ivan. Saint Francis of Assisi. Ignatius Press, 2006. The first words of the first Psalm. Among my absolute favorite medieval manuscripts is one that some people, at first glance, might call rather plain: the Utrecht Psalter. It’s anything but plain. This Psalter, dating probably to the early 9th century, was one of the most influential manuscripts of its time and is currently the most valuable book in the Netherlands. It contains all 150 psalms, 16 hymns, and illustrations for each of them. 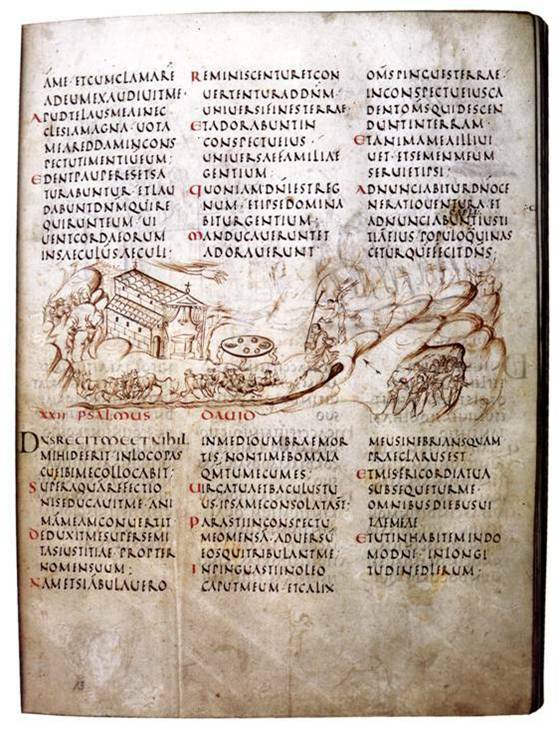 The Psalter began its existence in Reims, France, probably in the early 9th century. It may have been commissioned by Archbishop Ebbo, or possibly his successor Hincmar, as a gift for someone in the royal family. * It may well have been kept at court but by the year 1000 it had been moved to Canterbury Cathedral in England, where it would remain for the next several hundred years. With the Dissolution of the Monasteries it fell into private hands, eventually ending up at the University of Utrecht where it resides now. That's a rather empty city there. Its illustrations, the work of eight scribes, depict the contents of the psalms to which they are attached, sometimes very literally. A few verses from Psalm 44 (43 in the Psalter) that ask God to wake up and stop the speaker’s people from being slaughtered occasions a drawing of God sleeping while a the city is attacked. Psalm 23, with its lines about still waters, protection, a table set with food, the speaker’s enemies, and the Lord’s house, has images of all of those things. Probably the most famous Psalm. The sketchy, dynamic style of these illustrations inspired several other works. The ivory covers on Charles the Bald’s copy some of these drawings almost exactly. During the Psalter’s time in England it three copies were made: the Harley Psalter, the Eadwine Psalter, and the Anglo-Catalan (Paris) Psalter. Its influence has extended even to the present. There is some evidence that Dr. Seuss used its illustrations as the inspiration for the images in some of his own books. It is, in some ways a rather whimsical manuscript. In others, it’s completely serious. For its time period it’s style was something wholly new. All of these things contribute to a fascination that has lasted centuries. *Most likely Louis the Pious, his wife Judith, or Charles the Bald. Beckwith, John. Early Medieval Art. New York: Frederick A. Praeger, Publishers, 1964. HInks, Roger. Carolingian Art. Ann Arbor: University of Michigan Press, 1962. Child oblation was the practice of promising one’s infant or young child to the monastic life and was almost exclusively practiced by the upper classes. The reforming orders of the 12th and 13th centuries made a point of opposing the practice and requiring that postulants actually be of an age to make an informed decision before entering the monastic life. What they were speaking out against was a practice that had been going on for centuries and, as they saw it caused some pretty major problems in monastic discipline. Once such a promise was made, it was very hard to get out of. When the oblate was drawn to the religious life, or at least unopposed to taking it up, things worked out relatively well. It was when they had no interest in the monastic life that things got sticky. Some communities might allow a young oblate to leave the community. More often though, especially if the child had been sent to the Cluniacs, leaving was extremely difficult, if not impossible. *** As a result, many monasteries contained a certain number of people who didn’t want to be there and had no interest in asceticism. Child oblation served a purpose and for some it worked well, but the benefits weren’t worth the problems both for and caused by those who weren’t so inclined to the monastic life. A few Church councils tried to forbid the practice, but it didn’t begin to fall out of favor until the 12th century when it began its slow decline. *Abbot Suger of St. Denis came from a simple knightly family and went on to become friend and advisor two kings. Hildegard of Bingen and Guibert of Nogent came from similar families of the lesser nobility. **Mostly. Abbots and Abbesses tended to do better in the position if they hadn’t been raised exclusively in a monastery. ***Katharina von Bora, a later example, had to be smuggled out among fish barrels. Bouchard, Constance Brittain. Strong of Body, Brave & Noble: Chivalry & Society in Medieval France. Ithaca, NY: Cornell University Press, 1998. Archambault, Paul J. A Monk's Confession: The Memoirs of Guibert of Nogent. University Park, PA: Pennsylvania State University Press, 1996. Marie of Oignies (1177-1213) is sometimes, wrongly, considered the founder of the beguine movement. As one of the earliest beguines we have a vita for,* she is frequently used as an example, both of what one possible life path for an early beguine might look like and of the intense spirituality of the beguine mystic. Though she was not necessarily a typical beguine, her values and decisions shaped what would become a movement. It is at this point that her husband disappears from the story. Marie had begun to collect a community of women about herself, including a woman named Clementia, who seems to have acted as a companion and servant to her and who had followed her into the life of a beguine. Around the year 1207 Marie, followed by her companions, moved to Oignies to become a recluse attached to the community Augustinian canons there. It was here that she met Jacques of Vitry, who would become her spiritual advisor and who would later write her vita. Marie lived an extremely ascetic life, eating and drinking little and physically injuring herself as an act of penance. In her final years she was frequently overcome with religious ecstasies. According to her biographer, she spent the last few days of her life singing a rather extraordinary song in which she not only glorified God, but gave explanations on several theological points. Her life and Jacques of Vitry’s account of said life would eventually help gain ecclesiastical approval for the beguines. *Which is, in fact, the only major source on her life. **It is entirely possible they may have founded said hospital. Muessig, Carolyn. "Prophecy and Song: Teaching and Preaching by Medieval Women." In Women Preachers and Prophets through Two Millennia of Christianity, edited by Beverly Mayne Kienzle and Pamela J. Walker, 146-158. Berkeley: University of California Press, 1998. Holböck, Ferdinand. Married Saints and Blesseds Through the Centuries. San Francisco: Ignatius Press, 2002. Note: I'm changing my posting schedule a bit due to things going on in my life. I'll only be posting twice a week instead of three times. Biographies will still be Mondays, and I'll put up other things on Thursdays. The 11th and 12th centuries were a time of rising interest in religion in Europe. Gregory VII’s attempts at reform had prompted others to attempt to make their own changes, or in many cases, found their own monastic communities,* with the Cistercian Order rising to become one of the most prominent and widespread. And it was under their protection and encouragement that several other communities, reforms, and individuals flourished. I can’t hope to list them all here, but perhaps I might give a few examples. Hildegard of Bingen wrote to Bernard of Clairvaux in 1146 or 1147, asking for advice. She had been having visions her whole life and finally, at age 49, felt the need to speak out about them. But doing so without the approval of some higher authority was not an option. Bernard’s reply to her was short, but encouraging, urging her to “recognize this gift as grace and respond eagerly to it with all humility and devotion”. A century or so later, it was quite common to find Cistercian houses taking beguine communities under their protection. The beguines got political protection, spiritual guidance, and validation in the outside world based on the fact that the Cistercians, who were known for their holiness as an order, were seeing to their orthodoxy. The Cistercians, meanwhile, gained both access to sense of spirituality from outside their monasteries and the prestige of guiding another holy group of people. The prestige connected with the Cistercians was no small thing. Accounts of the founding of the Gilbertine Order** make much of the rather minor role Bernard of Clairvaux and the Cistercians played. For smaller and newer groups, association with the Cistercians gave them both credibility and some protection against accusations of heresy. The Cistercian Order as a whole, was not generally so enthusiastic, though they seem to have preferred encouraging and protecting other sorts of monasticism and religious life over admitting more women’s houses to their Order. There was, after all some benefit. They gained prestige and a reputation for encouraging good spiritual practices among both the religious and the laity. It was a situation that worked out relatively well on both sides. *There were actually so many religious orders being founded at this time that the Fourth Lateran Council had to ban the formation of new ones in 1215. **The only monastic order originating in England, its communities were all double monasteries. Flanagan, Sabina. Hildegard of Bingen: a Visionary Life. 1989. Nichols, John A. and Lillian Thomas Shank, eds., Distant Echoes: Medieval Religious Women, Volume One. Kalamazoo, MI: Cistercian Publications, 1984.